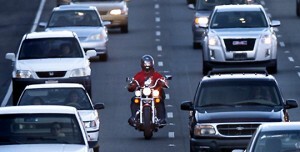 A proposal to make Nevada the first state in the nation to legalize motorcycle lane splitting was recently denied in the state Senate. “Most of the world except the United States has lane splitting. By moving riders “out of the crash zone” we may save “as many as 100 lives per year; based on data from the UK. Proponents also pointed out that being between cars is a safer position for motorcyclists than behind cars. While the Bill passed the Assembly with little opposition this past April, it died in the Senate in a 5-16 vote. Had the legislation passed, it would have made Nevada the first state in the nation to officially legalize lane splitting. California currently permits the practice because there’s no law regulating it there. Many countries throughout the world, including much of Europe, allow motorcycle lane splitting.